While the world celebrates this precocious talent, this was a dream waiting to happen and not just an overnight sensation. As early as age 14, young Usain was opening eyes with his lightning speed from regional championships in western Jamaica to national meets set in Kingston to meets in the wider Caribbean. Usain’s ascent to the pinnacle of world sprinting started with the most unlikely of events as his first medal at any meet came in the 80 hurdles in Class Three at Western Champs held on the campus of his Alma Mater William Knibb Memorial High in Martha Brae, Trelawny when he ‘jumped’ his way to a bronze medal. Because he towered above his peers even then, Bolt was also entered in the high jump event and was a promising fast bowler in cricket before been encouraged to channel his energies on the track. 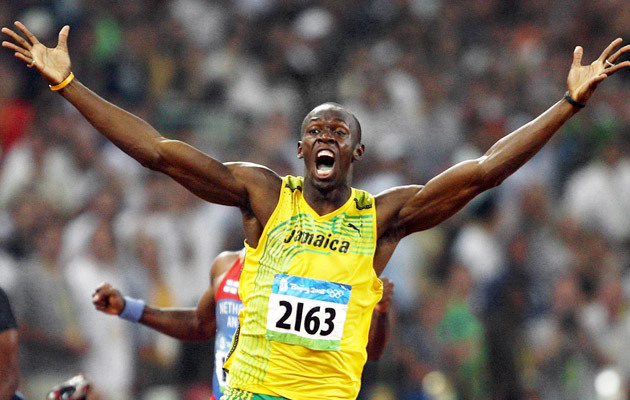 By 2001 Bolt became a known commodity and he sent signals that he would be a world beater in early 2002 when he cruised to a hand timed 20.3 seconds to win the 200m at Western Champs finals at Catherine Hall. Later that year he went on to win the 200m/400m double at CARIFTA Trials before winning four gold medals at the meet held in Nassau, Bahamas. He announced his arrival to the wider global audience in July 2002 when at the IAAF World Junior T&F Championships in Kingston in front of the biggest crowd ever to watch these meets, he won the host nation’s only individual gold medal, winning the 200m in 20.61 seconds. He left that meet with three medals including two silver medals in the relays, anchoring the 4x100m team and was part of the 4x400m team as well. That was the start of a meteoric climb to the top that also saw him winning two IAAF Rising Star awards. It was not always smooth sailing however as injuries slowed him down at several junctures of his career. Soon after breaking the Word Junior Record in the 200m with a time of 19.93 seconds at the CARIFTA Games in Hamilton, Bermuda in 2004, Bolt was slowed by a troublesome hamstring injury. He qualified for the final of the 200m at the 2005 IAAF World T&F Championships in Helsinki, Finland but in cold and wet weather pulled up before the finish holding his hamstring. He missed what turned out to be a ‘Jamaican party’ at the 2006 Commonwealth Games in Australia in 2006 when he suffered another hamstring injury while running a leg of the 4x400m relay for the IAAF High performance Centre’s team at the Gibson Relays in Kingston. Jamaican athletes swept all the sprint events at the meet, despite his absence. Fortunately, he recovered well enough later that year to set a personal best of 19.88 secs in the 200m and place second in the 200m at the IAAF World Cup of Athletics in Stuttgart, Germany. 2007 was the breakthrough year in that he broke the 30 year old Jamaican 200m Record, held by the great Donald Quarrie, with a time of 19.75 secs to win the Jamaican Senior T&F Championships. He went to the 2007 IAAF World T&F Championships in Osaka, Japan in good form and won two silver medals in the 200m and 4x 100m relay. 2008 was Usain’s breakout year when he rewrote the history books and became one of the biggest sports stats on the planet. Since then he has gone from strength to strength with his heroic achievements in the Olympic Games in Beijing, London and Rio and in the IAAF World T&F Championships in Berlin, Daegu, Moscow & Beijing.